There used to be two statements that every garden designer dreaded hearing: ‘We’re going to need plenty of space to kick a ball around’ and ‘We want the swimming pool near to the house’. The first remains irremediable, but the second has become a welcome challenge, a positive pleasure. The days are past when a swimming pool meant insulting the garden with a Radox-coloured rectangle surrounded by bleach-singed turf. Nor do we adopt the old alternative strategies any longer, which were to hide the pool behind high hedges, like a tennis court, or to doll it up with pillars and pavilions, like something from Tiberius’s villa. Far from shunning or disguising them, some of our best garden designers are reinventing pools and wanting to put them centre-stage before their clients even ask. We are in the midst of swimming-pool boom-one could almost call it a cult. As you might expect, it began in places where outdoor swimming is a perennially good idea. In California, it has long been understood that the pool should be a development of, and an ornament to, good modern garden design. And, in the present century, we welcome that most enigmatic and desirable feature, the infinity edge, where the water’s surface sits level with a precipitous wall and becomes a false horizon, meeting the sky or sea beyond. New British pools don’t attempt to imitate their counterparts in Corfu or the Caribbean. They draw on other and far older sources of inspiration. Although modern and Minimalist, some of them recall the rectilinear rills that are such a classic feature of Indian and Near Eastern gardens. 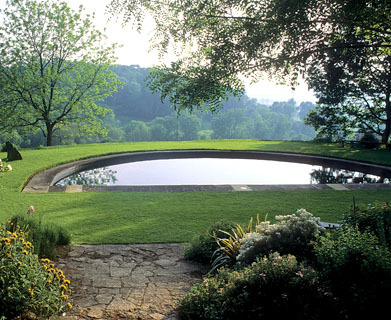 Others continue a home-grown tradition that began with taking a plunge in a natural pond or lake and evolved, in the Edwardian era, into something really rather clever: a purpose-built, brick-lined swimming tank filled with fresh water and surrounded with slightly submerged plantings whose job was to look good and to keep the water clean. Even if you don’t feel entirely happy entrusting hygiene control to bulrushes and swamp cypresses, with modern-day ‘planted’ pools, you can not only grow water lilies, but also swim among them. Twenty-first-century swimming-pool designs are features to be yearned for and made much of, whether we’re taking about a sheer-sided canal of monumental simplicity and elegance or an informal oasis nestling amid a profusion of plants. Just in time for summer, the British swimming pool has finally arrived, along with new filtration plants and non-toxic chemicals that mean the water can remain fresh and viable.